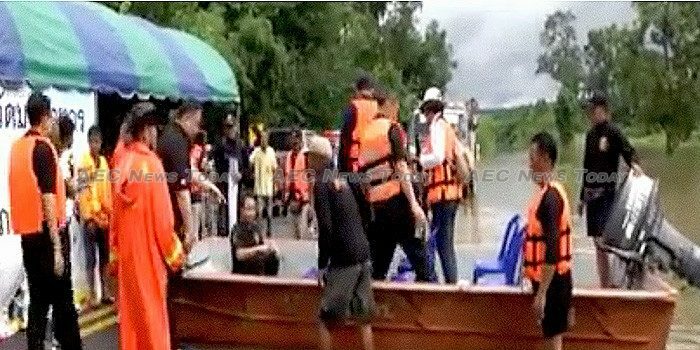 0:40 | King Maha Vajiralongkorn Bodindradebayavarangkun has instructed Lieutenant General Thitathan Suksri and the Rajaprajanugroh Foundation to deliver royally-bestowed survival bags and consumables to some 2,000 flood victims at Udom Darunee school in Sukhothai Province. 1:43 | More than 1,000 civil workers and volunteers in What Sri Phum Bho in Sri Racha district, Chonburi Province, have come together to perform a series of duties in celebration of the King’s birthday anniversary. Activities included making of organic fertilisers, and disposing of 500 tons of water weeds to prevent and moderate the effects of floods and drought. Collected weeds will be used to produce plant food which will be distributed to local agencies. 2:27 | While attributing the ongoing flood situation in the northeastern provinces of Thailand as a natural phenomenon, Prime Minister General Prayut Chan-o-cha has instructed relevant agencies to urgently install water pumps in flood-affected areas and for each province to survey the damage to life and property in order that those affected can receive prompt assistance from the government. The instructions coincided with the Ministry of the Interior (MoI) mobilising teams to help flood-affected people by building sandbag walls around places for shelter. 3:47 | The Highways Department has reported that highways in 15 provinces have been submerged by flood water and are currently closed, while there is still flood water on the runway and taxiway of Sakon Nakhon Airport, whose closure will be reviewed today, July 31. 4:33 | NBT World takes a close look at the government’s plan to build houses for some 1,395 ‘panhanders’, homeless people, and low income earners in Bangkok, Chiang Mai, and Khon Kaen. 7:01 | Constitution Drafting Commission (CDC) chairperson, Meechai Ruchuphan, has said that the drafting team has no objections to the legislation regarding criminal procedures for holders of political office as the law meets the requirements of the Constitutional and is on par with international practices. Individuals allegedly involved in primary election fraud can still run for office until they are proven guilty, in which case they will be banned from parliamentary elections and could face additional charges. 7:58 | National Reform Steering Assembly (NRSA) speaker, Captain Tinnapan Nakata, will hand over the results of the groups work on reconciliation to Prime Minister General Prayut Chan-o-cha at a ceremony to be broadcast live on television today, July 31. 10:59 | The northeastern province of Buriram is holding a pork festival featuring more than 40 food outlets best known for their pork menu, an exhibition of Buriram’s food history, entertainment shows, a fashion food cooking contest, a pork eating competition, and a football match between Buriram United and Ubon UMT United to promote provincial food and tourism. 11:49 | The Department of Provincial Administration (DPM) and Ministry of Interior (MoI) have reported that 1,833 Thai pilgrims, the majority from Southern Thailand, have applied for Hajj visa’s this year and that more than 4,600 pilgrims have safely arrived in Medina, Saudi Arabia to prepare for the 2017 Hajj season in Mecca which commences on August 30. 13:10 | NBT World takes an informative look at the just concluded ‘My Little Farm’ event held between July 22-30 to promote organic agriculture and creative products in accordance with the country’s agricultural policy under the Thailand 4.0 policy. Aimed at improving entrepreneurship skills, the event provided free space for ‘small and smart farmers’ to sell their produce to consumers. 15:36 | Esan Expo 2017 will be held between August 8-14 at Central Plaza Udon Thani. The event follows a similar event last year in Bangkok which generated more than Bt50 million (about US$1.5 million). Esan Expo 2017 aims at expanding marketing opportunities for local business operators and to open the way for trade talks between Thai and operators from neigbouring countries and China.